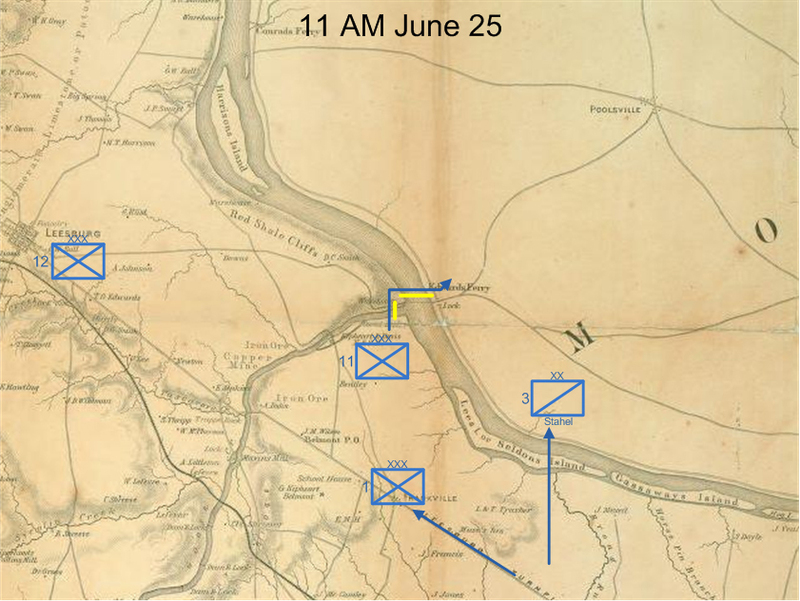 Eleventh Corps encamped below the mouth of Goose Creek, prepared to cross. 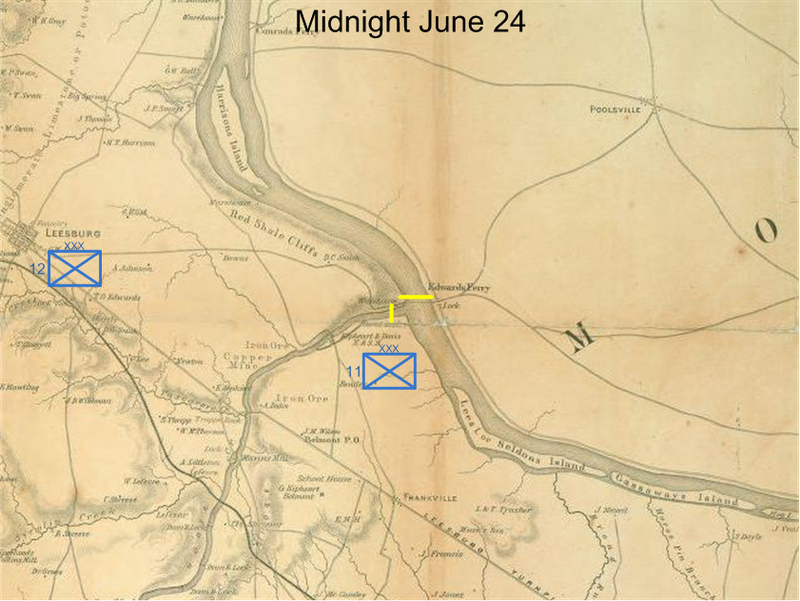 Twelfth Corps guarding the approaches to Edwards Ferry, centered at Leesburg. The Eleventh Corps continues to cross after delays and large numbers of additional horses. 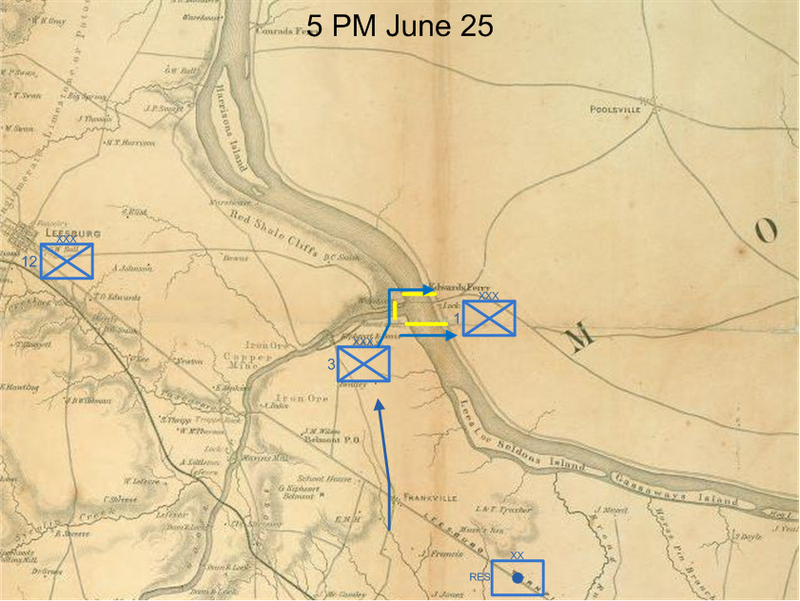 Stahel’s Cavalry division crosses downstream at Young’s Island Ford, minus wagons which were probably sent to Edwards Ferry. First Corps marches up Leesburg Pike toward the crossing point. Twelfth Corps remains in Leesburg. Eleventh Corps continues past Edwards Ferry on towards Point of Rocks, Maryland. Third Corps, which moved up from Gum Springs (modern day Arcola), Virginia, proceeds to cross. Because Third Corps turns left and marches the C&O Canal towpath, likely it used the upper bridge. First Corps, therefore, must have used the lower bridge, completed after 2:00 PM that afternoon. The Artillery Reserve marches down Leesburg Pike to wait crossing the next day. 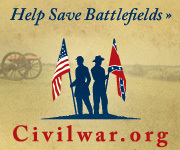 The Twelfth Corps remains in Leesburg but prepares for movement in the morning.